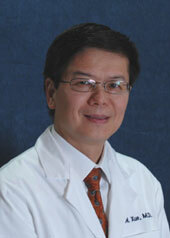 Dr. Wayne Xue is an American Academy of Dermatology award winning Dermatologist and Dermasurgeon. He is board certified in Dermatology and Dermatologic Surgery. trained as both resident and fellow in Dermatology and also obtained his PhD degree in Cancer Biology. Both of his scientific research and clinical studies led him to win the Investigator Award in Dermatology by the American Academy of Dermatology in 1999, a prestigious honor awarded to a few dermatologists nationwide each year. He is the first author of numorous peer reviewed publications including Journal of American Academy of Dermatology, Journal of Cancer Research, Journal of Immunology, Journal of Cutaneous Pathology, among 12 original publications. After completion of his dermatology training with certification of American Board of Dermatology in 2001, he joined cosmetic and skin cancer surgery groups for several years where he performed a variety of cosmetic procedures and dermatologic surgeries including Mohs surgery, in addition to practicing general dermatology. Over the years, through continuing post graduation training, he has persisted at attaining the most advanced dermatology training and treatment of a variety of skin diseases. He has frequently volunteered community services, including free skin cancer screening. He has been awarded several community service awards. He has been awarded as one of the America's Top Dermatologists since 2007. Dr Xue has been awarded as one of the America's Top Dermatologists since 2007.